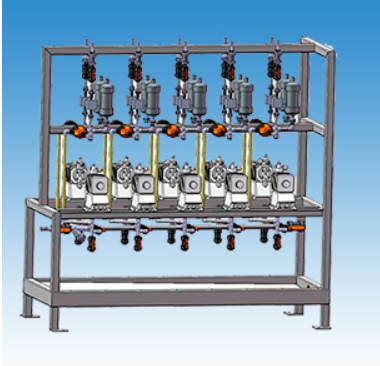 IWAKI Nordic produces high-tech dosing cabinets designed for the IWAKI dosing pumps. 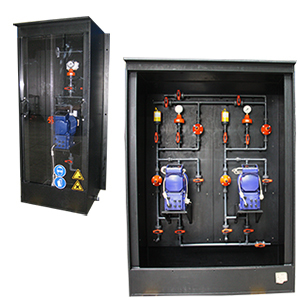 We offer 32 standard versions with predefined pumps, cabinet and connections, which should manage the majority of inquiries. Further we can offer you special designed solutions in cooperation with Weber Kunstofftechnik GmbH. Our dosing systems and solutions are designed to withstand the most demanding operating conditions. Below you will find an overview of our 32 standard dosing cabinets. Feel free to contact us at tel. 4824 2345 for additional information, queries or other requirements. *Please contact us for accurate measurements. Dosing cabinet with 10 pumps for anti-foam liquid.